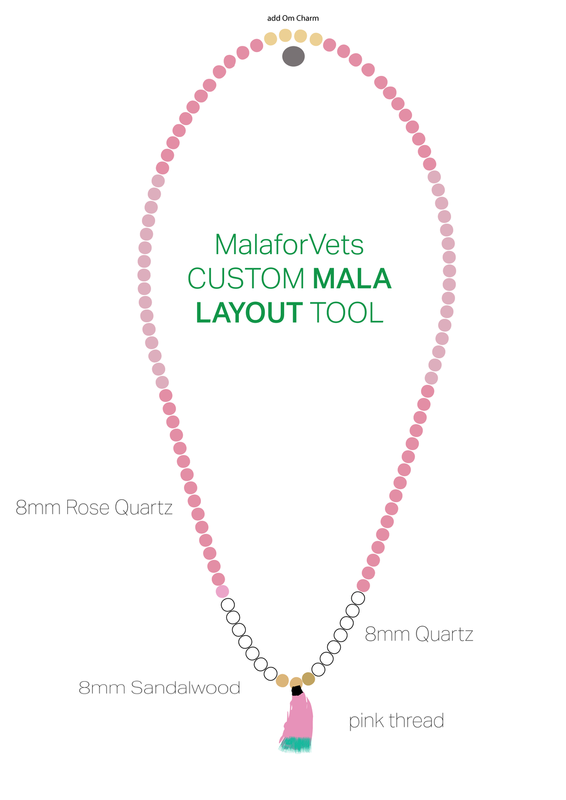 Are you looking for a custom mala for your yoga studio, non-profit or retreat? Perhaps you want to create something meaningful for some loved ones, friends...or maybe just you? MalaforVets can help. I firmly believe that you can buy mala beads from anyone, but my brand identity and the work I am trying to do puts me in a niche market. A market that is doing more than just making money, rather helping to take care of our Vets. I support Mindful Yoga Therapy, the Give Back Yoga Foundation, VETOGA, Connected Warriors, Warriors at Ease, and Mission 22 as well as pass out free swag to Vets and donate items to fundraisers. Exclusive Design | This is my favorite option as it is personalized and special to your students. The minimum order is 15 mala beads or 15 wrist mala beads. When I buy larger amounts of stock, I get a discount, and I can share that discount with you. This option also includes a per mala donation to one of the Veteran non-profits I support. I suggest $10-15 per mala which I include in the price. I have found people are willing to pay an additional $10-15 if they know it is going to a good cause. This option allows you to set your own price point when you sell the items. It will also include my packaging items: box, bag, and mala care instructions. Justin Blazejewski is on a mission...to bring yoga and the healing arts to Veterans. He is a Marine Corps Vet and a great friend of mine. VETOGA’s mission is to provide yoga, meditation, and healing arts to military, veterans, their families, and communities. We accomplish this by holding free monthly yoga classes, events and veteran specific 200-Hour Teacher Trainings throughout the year. VETOGA is a non-profit based in Washington, D.C. You can help fund our teaching program on their Fundraising Campaign right now. Helping Veterans to find a calm and steady body/mind to continue productive and peaceful lives through the support of the mindful practices of yoga. The Connected Warriors mission is to empower Service members, Veterans and their Families worldwide through Trauma-Conscious Yoga. Our mission is to increase awareness about the power of yoga and meditation and educate a network of professionals qualified to share evidenced-based practices through programs that support the health and healing of service members, veterans and their families. The Mission 22 wrist mala is exclusive to Mission 22 and will be available for sale on their website soon at this link. Mission 22 reached out to me because my story of post traumatic growth is right in line with their mission. They are passionate about supporting Veterans who are continuing to fight battles even though they have returned from the battlefield. Elder Heart is the 501C3 behind Mission 22. It's Board of Directors is comprised of Special Forces operators Magnus Johnson, and Mike Kissel and Infantryman Brad Hubbard. Because of their personal battles with PTSD and TBI they have made it their mission to raise awareness, enlist support, and end veteran suicide in America. You can make a donation to this organization at this link. The Yoga for First Responders wrist mala is exclusive to YFFR! If you're interested in buying one, contact them directly with this link. I first met the Director of YFFR, Olivia Kvitne at the Sedona Yoga Festival when I was presenting the Mindful Yoga Therapy training several years ago. We instantly hit it off. YFFR has a mission of bringing yoga philosophy, through somatic and cognitive exercises, to practical applications for first-responders around the country. We do this through training teachers and psychologists on our unique approach and continue to support them while initiating yoga programs into training academies, police and fire departments, and local community settings. They need your help...if you're interested in making a donation, use this link. The Ground Your Sol Mala is exclusive to sol yoga and is only available for purchase at their studios in: Fredrick Maryland, New Market Maryland, and Hagerstown Maryland. I met Mary from sol yoga through a student/yoga instructor who attended a Mindful Yoga Therapy training I taught. They also have a custom wrist mala available called the Sooth Your Sol wrist mala.